Watch this live interview of Sindhu Gangadharan , VP and Head of Product Management, SAP Cloud Platform Integration and Internet of Things, Process Orchestration and Financial Services Network at SAP TechEd Bangalore 2017 to learn about the greatest and newest capabilities of SAP Cloud Platform Integration and IoT. In this interview, Sindhu’s talks about how SAP is helping its customers in their digital transformation journey and in defining their integration strategy. You will also learn about the latest capabilities introduced in tooling, operations and monitoring, enabling integration developers and customers to build their integration content using Cloud Integration. Also learn how the standard content from SAP in the SAP API Business Hub is helping customer’s accelerate their integration projects and hear about the all the new integration scenario’s supported for integrating both with SAP and non SAP systems with co-innovation from our partner ecosystem. In IoT, Sindhu talks about how we are elevating the capabilities by making it a SAP Cloud Platform capability with the huge list of protocols supported and openness to innovate with the SDK. Also learn about the edge capabilities and how you can build cool applications leveraging the IoT Application Enablement consuming the IoT services. 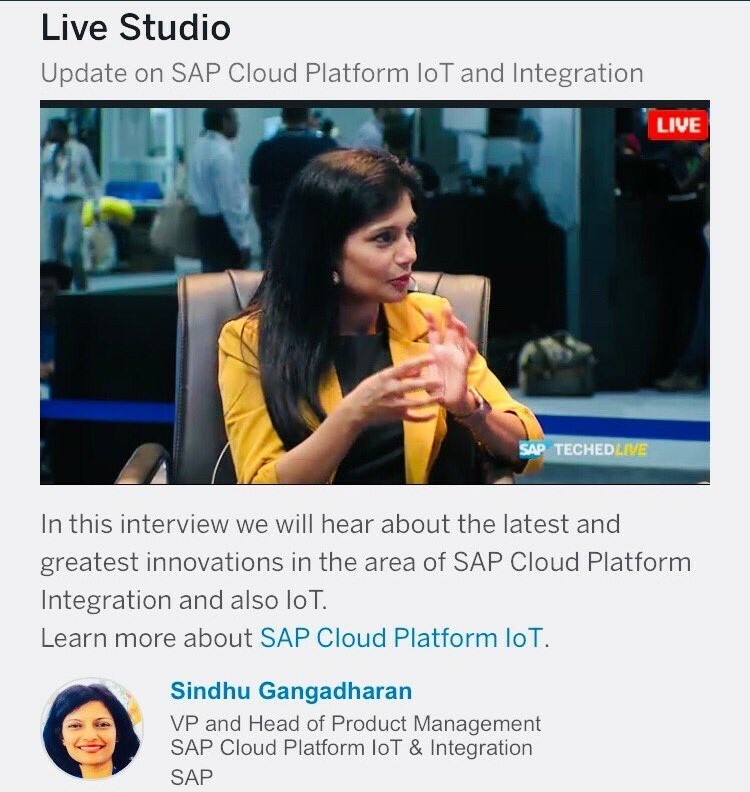 Also listen in to the Live interview of Sindhu with Delaware Consulting, who are SAP partners and early adopters of SCP IoT talk about their customer experience with IoT and how SAP Leonardo and SCP IoT is helping the customers in their businesses. Stay tuned for more updates from TechEd Barcelona 2017! !